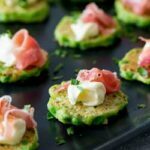 These Pea Bites with Prosciutto are the perfect little appetizer bite. They can be made in advance and are served at room temperature, so they are perfect for parties. They are such a fun green color and the sweet pea works so well with the salty prosciutto. Plus you can use frozen peas! Making these in advance? Sounds perfect for a party! 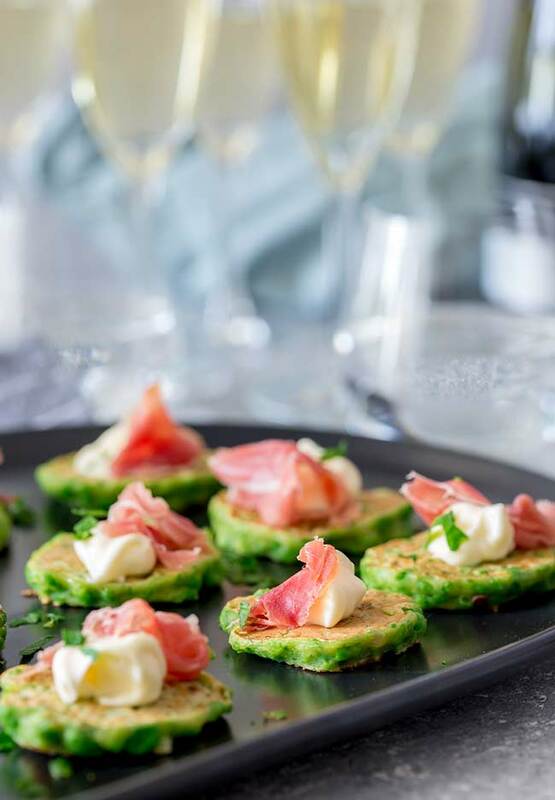 These pea bites are a take on my super popular Pea Fritters with Goats Cheese Cream. Over on that post I talk in detail about how you can make these in advance. Feel free to head on over and have a read, but just to recap (and this is in the recipe notes) once cooked they will keep in the fridge for 2 days and the freezer for 3 months. I recommend serving these at room temperature. And I can use frozen peas? Oh yes!!!!! Frozen peas are just the best aren’t they!!! They can be an almost instant side to so many dinners and they can be used to make cute little appetizer/hors d’oeuvres like these pea bites. I think frozen peas are best here as they are still sweet and firm, rather than a bit powdery and dull like some fresh peas. They ahem just sat on the shelf too long and the sweetness has gone. Better to buy frozen peas that have that flavor locked right in! 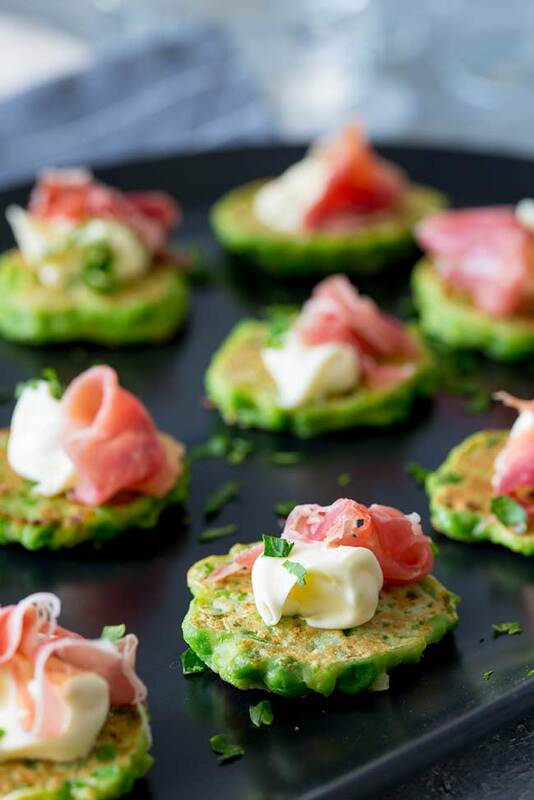 If you love vegetables fritters then try my Zucchini Pancakes with Feta Cream. They are always a hit at parties and the kids love them too! Cook the frozen peas in boiling water for 3 minutes until softened then drain and immediately plunge into the iced water. Set aside to fully cool. Put the roughly chopped green onions into the food processor and pulse until they are chopped. Add the drain cooled peas and pulse chop until you have a nubbly mixture. Add in the egg, milk and fresh parsley then pulse again until just mixed. You want the peas to still have some texture. Heat the oil in a large heavy fry pan, then fry teaspoons of the mixture until golden and set around the edges, flip the fritters and cook for a further minute. Remove the first batch of fritters to a plate and repeat until all the mixture has been used up. Serve the fritters at room temperature with a small dollop of mascarpone and a thin swirl of prosciutto. To keep refrigerated, cook the pea bites as per the instructions then once they have cooled popped them into a airtight tupperware container and keep refrigerated for 2 days. To freeze placed them in a zip lock bag and lay it flat in the freezer. They will keep perfectly for 3 months. In both cases, bring to room temp before serving. 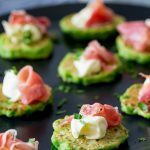 If you love food why not subscribe to my newsletter, I will drop you an email every now and then, just to say hi and send you a couple of recipes think you might love, like these Pea Bites with Prosciutto and Mascarpone. They really are so delish. I nearly always have a stash in my freezer! Ohh my goodness.. Looks lovely and delicious. This would make the perfect appetizer to pass around at any party! Peas are sooooo often overlooked but they’re one of my favorite vegetables ever! I’m LOVING these pea fritters like woah! So good!